Posted in: BSU Geoscience Seminars. Tagged: geology, planetary science, snowball earth. Artist’s depiction of ancient snowball Earth. 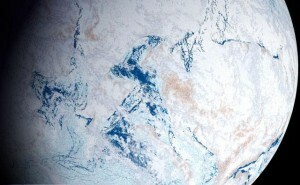 From http://ichef.bbci.co.uk/naturelibrary/images/ic/credit/640×395/s/sn/snowball_earth/snowball_earth_1.jpg. I sat in on a fascinating seminar today in the Geosciences Dept. given by Prof. Carol Dehler of Utah State University about statigraphic and isotopic evidence for a snowball Earth event. Over its 4.5 billion year history, the Earth has probably experienced at least one, maybe more, severe glaciation events, during which ice covered more or less the whole Earth’s surface. These events were probably very challenging for ancient Earth life, and some of the best documented events occurred at the end of the Neoproterozoic, about 540 million years ago, probably driving mass extinctions and possibly kicking off the Cambrian explosion in animal life. In her presentation today, Prof. Dehler discussed her extensive field and laboratory studies of statigraphic deposits in the western US, laid down about this time in Earth’s history, deposits she calls ChUMPs. While the ChUMP layers were building up, the Earth was going through dramatic geological and climatic variations. The ancient supercontinent of Rodinia was breaking up, and Dehler can see evidence of volcanism that accompanied this rifting as huge excursions in carbon isotopes locked up in the ChUMP deposits. The carbon dioxide injected by these large eruptions probably also drove climate change, raising global temperatures, which caused rapid weathering of rocks that locked up the excess carbon dioxide in the rocks. With so much CO2 sucked out the atmosphere, it’s possible the Earth then underwent rapid cooling, and this is what could have driven Earth into a snowball state during the Neoproterozoic. However, the story told by the rocks and their isotopic compositions is complicated, and it’s not entirely clear whether the enhanced volcanism preceded the snowball Earth event: The ages attributed to the rocks still have uncertainties that are too large to be sure. In any case, Dehler presented a compelling, complex story about the Earth’s ancient history, meticulously pieced together, one mineral grain at a time.